Book 1: Public Lands in Jacksonian Politics. Author: Felle. Book 2: General Jackson . 1892. Author: Parton. Books 3 and 4: Life and Times of Andrew Jackson. 1904. (two volumes). Author: Colyar. Book 5: Andrew Jackason the Border Captain. Author: James. Book 6: Andrew Jackson Portrait of a President. Author: James. Book 7,8, and 9: Life of Andrew Jackson. 1860. (3 Volumes). Author: Parton. Book 10: Making Democracy a Reality. Author: Bowers. Book 11: Andrew Jackson's Hermitage. Author: Caldwell. Book 12: The Papers of Andrew Jackson, Guide and Index to the Microfilm Editions. 1987. Author: Moser et al. 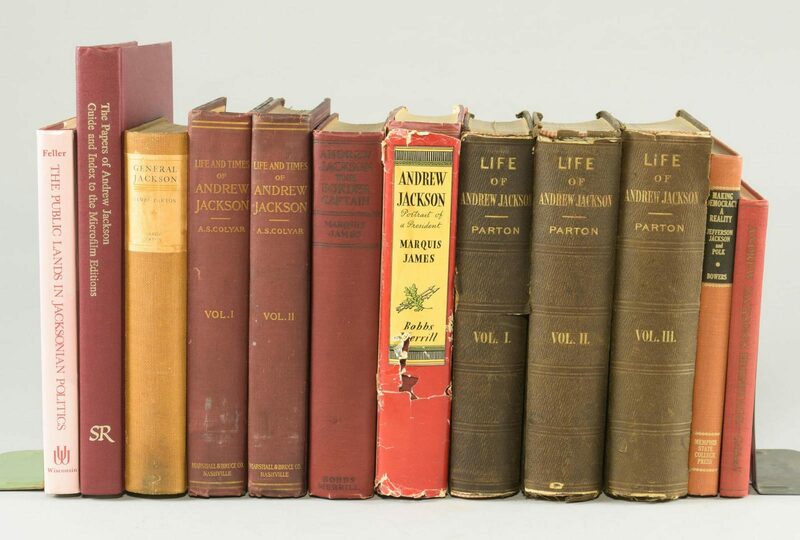 Books range in size from 7 5/8" H x 5 1/4" W x 3/4" D to 11 1/4" H x 8 7/8" W x 1 1/4" D. Collection of Charles and Ann Wells, Nashville, Tennessee. CONDITION: Books are in good to very good condition. Some dust jackets have tears and chips. Military Annals of Tennessee- Confederate. 1886. Author: Lindsley has been rebacked with just part of original spine left.